Looking for some comfort food? This is it! Delicious Instant Pot Bourbon Butternut Chicken. Creamy, salty, slightly spicy with a little sweet – perfection in your mouth! Interestingly enough Bourbon Chicken was created in New Orleans by a Chinese chef on Bourbon Street. There seems to be some discrepancy as to whether bourbon was an ingredient in the chicken or if it was named after Bourbon Street. When creating this dish, I decided to add butternut squash to the dish. Not only does it add a richness as well as creaminess to the dish, it also adds in a vegetable to make it more filling with less points. My kids love this dish and they “hate” any kind of squash. 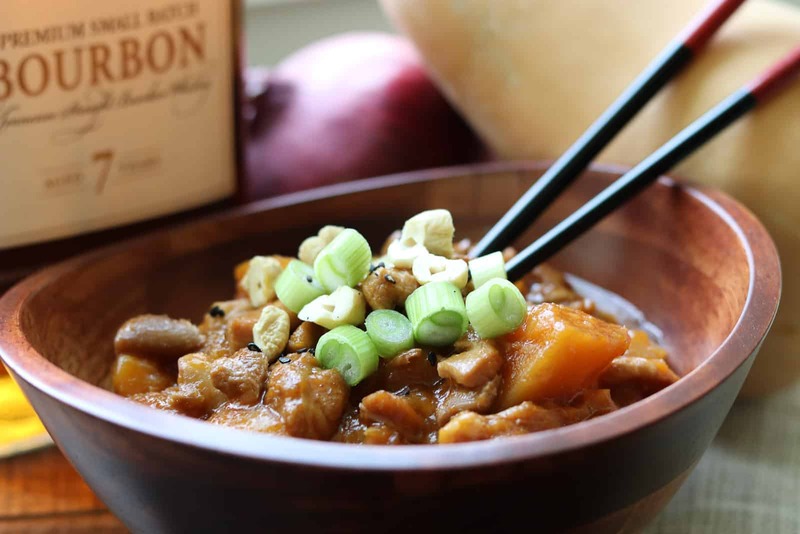 Instant Pot Bourbon Butternut Chicken does make quite a bit of sauce so be sure and serve it over rice or cauliflower rice so you don’t miss any! This post does contain affiliate links which means that if you click on them and/or buy something I may earn a small commission -at no extra cost to you. I only recommend the things I actually use in my kitchen. By clicking and buying these items, you help keep my recipe blog running. Thank you! Delicious Instant Pot Bourbon Butternut Chicken. Creamy, salty with a little sweet- perfection in your mouth! Serve it over rice or cauliflower rice. Garnish with green onions, black sesame seeds and toasted cashews. Spray the Instant Pot liner with oil from your Olive Oil Mister. Add sesame oil. Turn Instant Pot to saute. While waiting for Instant Pot to heat up, in a small bowl or glass measuring cup, mix soy sauce, ketchup, bourbon, vinegar/Shaohsing wine, honey, brown sugar, cayenne and red pepper flakes. Set aside. Add onions and garlic to the Instant Pot. Brown for a few minutes, use more of your Olive Oil Mister if you need to keep the onions from sticking and burning. Add chicken, salt and pepper, and soy sauce mixture. Cook for about 3 minutes so the alcohol in the bourbon burns off. Turn off Instant Pot. Add butternut squash. Place lid on Instant Pot. Set knob to sealing. Press “Manual,” or on some models, “Pressure Cook,” and decrease time to 3 minutes (yes, really 3 minutes!). When the timer beeps, allow to sit for about 5 minutes, then do pressure release. In a small bowl or cup add cornstarch and 3 T. water. Mix thoroughly then add to Instant Pot mixture. Turn Instant Pot to saute and cook until sauce is thickened usually only a few minutes. Serve over rice or cauliflower rice in bowls and garnish with green onions and sesame seeds if desired. It’s also great with a little cashews crushed over the top (if you have enough points). Don’t leave out the fresh ginger! It makes a big difference. When testing this recipe, I forgot it on the second take. I couldn’t figure out what was missing until I tasted the first batch again. Ginger! It’s that important to this dish. 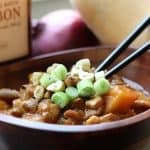 4 Replies to "Instant Pot Bourbon Butternut Chicken"
I made this a couple of weeks ago for dinner guests and we all loved it. I didn’t use Bourbon or corn starch and it was still delicious and had a nice thick stew-like consistency. Later I did serve leftovers over cauliflower rice and it was delicious. So glad you loved it!!! Thanks so much for commenting! Making this for dinner tonight — hoping my kids like it! Me too!! Let me know!